Videos, installations and drawings highlighting how history is rewritten, documented and interpreted. 13 March - 13 June 2014, SAF Art Spaces, Sharjah, UAE. Interview with the artist. Wael Shawky uses a range of media to explore issues of history, religion, culture and the effects of globalisation on society today. In video, photographs, installations and performance, he mines traditions of entertainment and performance through multilayered works that force viewers to navigate the territory of truth, myth and stereotype. 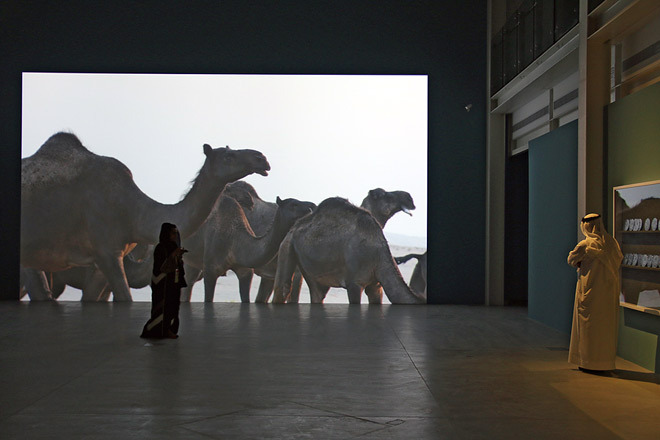 Religion and the tradition of storytelling – both oral and written – play a central role in Shawky’s aesthetic. His work often captures settings and social practices that present unexpected moments of irony: significant texts are translated into different languages; age and authority become inverted; and the separation between religious and social rituals is blurred. Curated by Sharjah Art Foundation Director Hoor Al-Qasimi, this exhibition highlights Shawky’s interest in how history is rewritten, documented and interpreted through a series of videos, installations, sculptures and drawings, including his new work Al Araba Al Madfuna II, co-produced by the Wiener Festwochen and Sharjah Art Foundation. Hoor Al Qasimi: Can you tell me a bit about your work Asphalt Quarter? Wael Shawky: Asphalt Quarter is based on the first chapter of Abdul Rahman Munif’s novel, in which he talks about a group of Bedouin fishermen living on the beach. Of course, when English petroleum companies come to this very simple village they want to build platforms, a factory and everything on the water. They started by getting the local community and the ‘simple people’ to work for them. The point here is that for a period of about four years, these people worked on building this platform without having any idea what they are building in the first place, they don’t know that they are building the future of Saudi Arabia. And he [Munif] is talking about this conflict, this situation. HQ: What’s the title of this book? WS: Cities of Salt. So of course, it’s a fascinating idea, someone building their own history. It’s really amazing, the idea that the people who don’t speak other languages and who don’t know what is happening, or what the story is, and that the others have a cunning plan… Everyone is in their own world, pretty much. So then, in order for me to translate this chapter of Cities of Salt, I went to the Western Desert in Egypt and asked people living there to bring their children to take part. We had sixty kids gather and told them that we want to build a runway for an airplane in one day with asphalt. We had found a type of asphalt that does not require heat, so then we made the whole runway and documented the event and the kids believed it without knowing the purpose. So that was a translation of that chapter of Abdul Rahman Munif’s book. I’m not sure if this idea or work will be liked or sensitive, I don’t know. HQ: We’re not showing Darb Al Arbaeen since you showed it recently at KW Institute for Contemporary Art in Berlin, but it also is a 4-screen projection and you worked again with children in the desert. WS: Yes, even here, the idea of camels, it’s a metaphor for nomadism. HQ: But Asphalt Quarter has not been shown for a while, right? Not many people have seen it. WS: It has hardly been shown at all, except in the Venice Biennale in 2003 and then, I’m not sure, we showed it in Darat Al Funun, it’s in their collection, and maybe once in Townhouse gallery. I’m just saying there are some similarities between them but they are different. HQ: But Dictums: Manqia I, the camel piece, ties Asphalt Quarter and Darb Al Arbaeen in a funny way. WS: Yes, yes. There is something good in both films, they are almost silent. There is almost the sound of environmental music, but that’s it. And there is no narration or anything of the sort. HQ: What can you tell me about The Cave ? WS: The Cave? I was invited for Platform Garanti in Istanbul where I took part in a residency. That was in 2004 actually, the same time when Turkey was trying to become part of the EU. So there were always protests in the streets and people trying to say that Turkey should remain an Islamic country and others were saying it should be a secular country. There was a political conflict. So at the time I was trying to create a self-portrait in Istanbul. I was reading a lot at the time and decided to make The Cave with me walking in a supermarket, where the supermarket is a metaphor for this capitalistic society, not just capitalism. But also at the same time since it’s a self-portrait I was trying to show myself as an artist, a Muslim artist, from a Muslim background. The supermarket can be a metaphor for many different things, even the art world that we are in, what does it mean to be travelling to these different cities to be presenting art. And then, there are layers in the work to do with the stories within The Cave, the idea of knowledge and power. Most of the scholars believe, this [Quranic] chapter was delivered to the prophet [Muhammad] to encourage the Muslims to emigrate from Makkah to Medina. It has to do with the concept of emigration and that, if you are weak and in a position where you don’t have much power and there is a lot of victimisation in your world, then maybe you’re forced to leave. You need to leave to gain more power and knowledge and you need to come back to make corrections in the world. One of the stories in The Cave is the story of the People of the Cave and how they went to sleep . This is sort of, a different type of emigration. Another type of migration is the type that happened to Moses, when he thought that he had all the knowledge in the world and then God told him that he needs to go and learn from someone else. So he travelled to see Al-Khidr , a very important person in Islamic Culture. God told him visit Al-Khidr who has this knowledge and learn from him. Another one was called Al Qarni, there are many, many stories, so in the video I have to recite this whole chapter by heart, from memory while walking through the aisles of the supermarket and I don’t make any mistakes. HQ: Do you think this idea of migration in The Cave is also related to Darb Al Arbaeen? In a different way? WS: Migration… it has to do with migration, but it’s a different type, yes. HQ: In Al Araba Al Madfuna I and II, you use the stories of Mohamed Mustagab. Why Mustagab? WS: I have been wanting and trying to do something with his work for over 15 years now. His way of narrating, the way he writes seems very realistic and factual but you know it’s mythical. HQ: The stories recited and the actions of the children on the screen aren’t the same. Can you explain why you wanted to have them act out one ‘story’ or event, while reciting another? WS: It is something else, what they are acting out is my experience inside this room, in this village in Upper Egypt. Al Araba Al Madfuna is based on a personal experience outside this village where I heard some stories about people trying to find a dead body. So you hear a tale by Mustagab but you’re seeing another story. I’m trying to say you have two systems, working parallel to each other in this series, or you have kids with the voice of adults, you’re hearing a story and seeing another story in front of you. Like narrating history- you’re hearing, the way Mustagab writes, I think we still have this inkling that it’s not true, it’s not real, there is something we don’t believe, and that’s always the outcome from mixing these two systems. HQ: Why are religion and history important in your work? WS: It’s part of my childhood, I lived in Makkah and was very affected by the power of language, even when I started to read a bit on Sufism, I was fascinated by the power of the word and language. Even if I don’t believe in history, I still try to use the source of written history to analyse this history. I’m criticising history by being very accurate and using exact phrases and sayings. The Cave is the 18th surah (chapter) of the Quran and has 110 verses. A number of young monotheistic men at the time were persecuted for their beliefs, and upon the guidance of God they fled the city and took refuge in a cave where they had been put to sleep (by God) for exactly 309 years as mentioned in the Quran. This was meant to protect them and therefore when they woke up they found themselves living in a society that had converted to believing in the same God as they did. Al-Khidr has been described as a revered figure in Islam and is described in the Quran as a righteous servant of God who possessed great wisdom and knowledge. Artist and curator. President and Director of the Sharjah Art Foundation, Sharjah, UAE. Multipart project, based on the composition and performance of a qawwali song. Presented at Sharjah Biennial 11. Interview about his new video installation Al Araba Al Madfuna, created for his Schering Award exhibition at KW in Berlin. Cabaret Crusades: The Horror Show File. His new film project using 200-year-old Italian marionettes.